A bit of a last minute posting here on MM, but the very nice people over at the InterCon have asked me to share their Gourmet night that is planned for Le Caprice tonight from 7:30pm. It's a "night of glamour and first class cuisine" - but a nice way to have a date with the missus mid-week. It's RO 50 net per person and you get a 6 course meal with paired wines for the meal, something I always like because then the wines are supposed to go with the food. Regular readers might know I'm not a big wine connoisseur but at least this way I know that the wine I'm drinking is meant to be going with the food I'm having! Anyway, there's still a few spots open, and if you're keen (or if your at home waiting for the husband to come in from work) for a bit of fine dining tonight, then drop Jill a line on 2468 0627 or email nitsuh.alemu@ihg.com to make a reservation and to ask for more information. 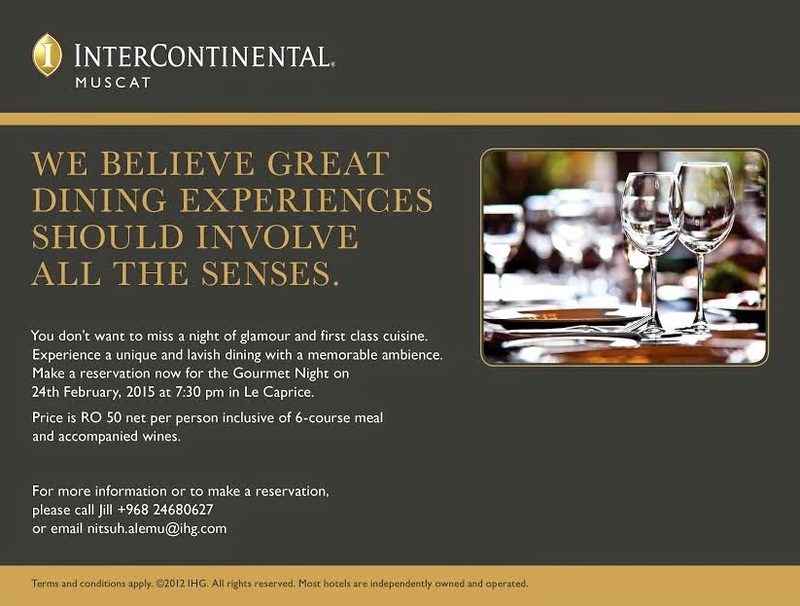 That must be fist time that "Gourmet" and (Muscat) "Intercontinental" is usd in the same sentence! The dinner was exceptionally good as were the wines. It should be mentioned that the Gourmet Night takes place on the last Tuesday of each month. This was the 4th dinner and I hope it will continue. Reservations can be made in advance. The previous comment was unnecessary. I wonder where he does eat.